This recipe can be found here. I found it on page 21 of The December 2011/January 2012 issue of Taste of Home Simple and Delicious. This was really good. It had some flavors that I am not used to cooking with but it came out great. I would decrease the amount of cayenne pepper for my taste buds, but my husband thought it was very good! He requested that we have it again! I actually just used two chicken breasts so I had quite a bit of the spice mixture left over. I would also not put on as much of the spice mixture onto each piece of chicken. This recipe was also very easy to make. I managed to get make it with no problem even with a toddler and baby! 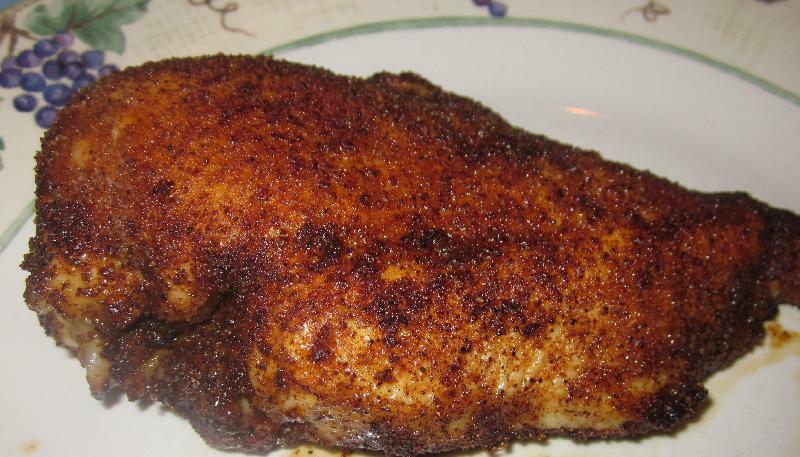 Combine the first six ingredients and rub over the chicken. Put the chicken in a greased 15-in. x 10-in. x 1-in. baking pan. Bake the chicken for 25-30 minutes or until juices run clear. Then combine the honey and the vinegar. Next baste it over the chicken during the last 10 minutes of cooking.